The band alleged the song "Lonely Boy" was improperly used to sell power tools, and "Gold on the Ceiling" to sell pizza. 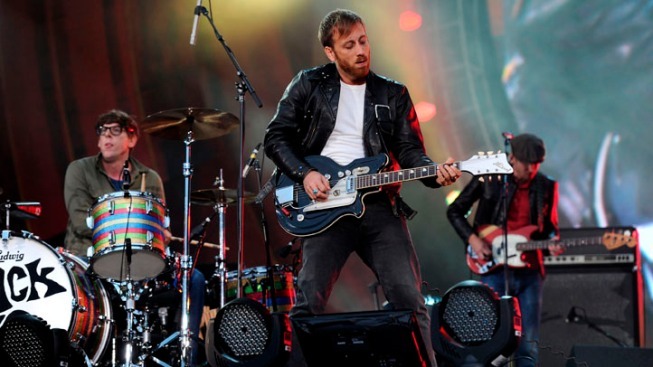 In this Sept. 29, 2012 file photo, guitarist Dan Auerbach, center, and drummer Patrick Carney of The Black Keys perform at the Global Citizen Festival in Central Park, in New York. The Black Keys have settled a pair of lawsuits alleging The Home Depot and Pizza Hut misused their music in commercials. The Black Keys told a federal judge the band has settled copyright infringement lawsuits against Pizza Hut and The Home Depot claiming misuse of their music in commercials. The band alleged the song "Lonely Boy" was improperly used to sell power tools, and "Gold on the Ceiling" to sell pizza. The Grammy-winning band sued in June. Both companies denied copying the songs. No details of the settlements were included in court filings. Stephen Holmes, a spokesman for The Home Depot, and a publicist for the band didn't have an immediate comment. A representative for Pizza Hut did not return a message seeking comment. Attorneys expect to file formal dismissals by early January, according to court filings. Both songs appeared on the rock group's seventh album, "El Camino," which was released last year and has sold more than a million copies. The Black Keys are comprised of Dan Auerbach and Patrick Carney. Musician-producer Brian Burton, who is known as Danger Mouse, also sued the companies. "Lonely Boy" and "Gold on the Ceiling" both topped the Billboard alternative music chart after being released. The Black Keys won two Grammy Awards in 2010 for music from their album "Brothers," which won the Best Alternative Music Album award that year.